Cleveland's QB dilemma - Hogan, Kizer or Kessler? The Kevin Hogan era got off to an inauspicious start this weekend, with the latest Cleveland Browns starting quarterback throwing three interceptions and finishing up with a game grade of 29.3, little short of disastrous. Hogan had shown flashes in limited action for the Browns over the past season and a half, but as a starter against the Texans he was consistently inaccurate and putting the ball in harm’s way, despite facing a Texans defense shorn of their best two pass-rushers, who also lost their third-best at one point in the game. The Browns have yet to give any playing time to second-year QB Cody Kessler, who showed some solid play as a rookie in 2016, including a passer rating of 91.6 when under pressure last season. 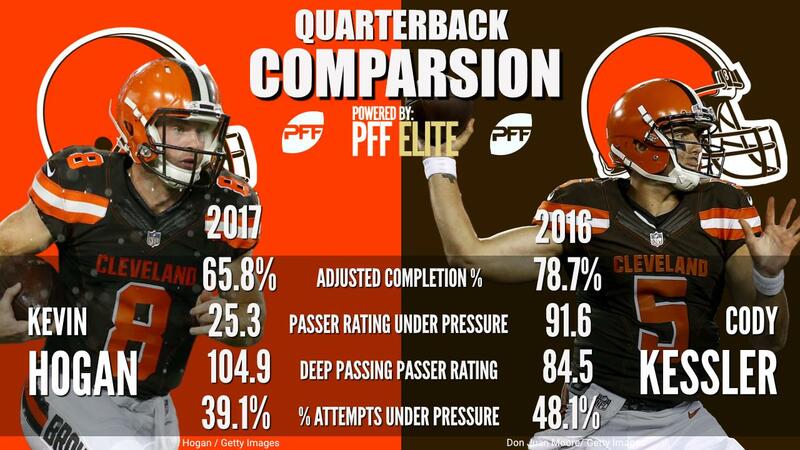 Kessler’s 2014 college grade of 90.0 is also the highest single-season mark we have seen from any quarterback on the Cleveland roster while they were in college.